Most of us use squash for cooking because aside from its delicious taste, it provides nutrients that improve our health. Squash is a good source of Protein, Vitamin A, Thiamin, Niacin, Phosphorous, and Copper. It is low in cholesterol and high in dietary fiber and Vitamin C.
Different types of squash improve eyesight, heart health, immune system, and skin health. Moreover, it can help prevent cancer, manage symptoms of diabetes, lower the symptoms of insomnia, and helps in treating arthritis and ulcer. It is known as Japanese pumpkin in New Zealand and Australia. It has dark green color similar to pumpkin, while the inside is orange-yellow. It has honeyed sweetness and has smooth almost fiberless texture. Kabocha can be baked, steamed or pureed to give buttery richness to soups. This type of squash has almost similar color and texture to Kabocha. The only difference is that it has an elongated shape. Acorn squash is usually used as a natural bowl for fillings. Its skin is edible. This squash is great for roasting and is usually cut or sliced. Delicata squash has a tender and edible skin. It has a creamy color with green lines on the ridges. Also known as peanut squash and sweet potato squash, the delicata has a soft texture, best for roasting and stuffing. Probably the most famous during Halloween, the pumpkin has bright orange skin and light orange flesh. It has a round shape and weighs 2-8 pounds. Pumpkins are best for cooking and has mellow sweetness when pureed. This squash is a tasty and healthy addition to breads, soups, and pies. Bigger pumpkins are usually used as decorations on Halloween because they are watery and less flavorful. This type of squash range in colors from orange or grayish blue. Its flesh is sweet that is best for pies and purees. It weighs 8- 20 lbs and it’s usually sold in cut pieces. Also known as West Indian pumpkin. It can be stored for longer periods of time because it has a hard skin. It has a golden orange flesh and tastes almost similar to butternut squash. This squash tastes like pumpkin. It’s shaped like a bell and has beige colored skin. Its smooth and thin skin makes it easier to peel compared to other types of squash. Butternut squash is dense and creamy and often paired with a variety of flavors such as cinnamon and smoky bacon. This squash is high in vitamins A and C.
It’s the yellow oval squash with stringy flesh. Best used as pasta as its taste greatly complements various herbs and butter. It usually weighs 4-8 pounds. The bigger the spaghetti squash, the tastier and thicker its strand of noodle-like flesh. Whitish- yellow and green in color, this type of squash is usually small, perfect for individual serving. Its flesh tastes like sweet potato and its skin is edible. While this squash’s exterior resembles that of the acorn squash and sweet dumpling squash, the skin of the carnival squash is a combination of green, white and orange. It tastes sweet, similar to Sweet Potato and Butternut Squash. Best used for soups, baking, and steaming. It looks like a small pumpkin with orange skin and flesh. This squash has a mushy-sweet taste which makes it ideal for roasting. This is an elongated-shaped squash with a golden-colored skin. This squash is soft like zucchini. Also known as Patty Pan, this squash has a small flower-like shape. It’s bright yellow and has a buttery taste. This type of squash also come in light green variety which is more commonly referred to as White Squash. This squash is also called Orange Hokkaido, Red Hubbard, and Potimarron. It has an asymmetrical shape. This squash has a yellow flesh and gives a chestnut-like flavor. Lumpy and huge, this squash has a grayish-blue skin and sweet orange flesh. This is a squash that comes in a variety of colors ranging from orange, to pink and light blue. It has a thick, firm, orange-colored flesh that has a sweet and rich fragrance. It’s said that blue and green varieties are flavorful compared to the pink. The gold nugget is a smaller version of pumpkin. It weighs 1 to 3 pounds. It has a bright orange flesh and skin. Best for baking, the gold nugget gives a starchy texture and has sweet flavors. This type of squash has a turban cap at the end of its blossom. The outside skin has a green, yellow to orange color. It has a removable cap that’s why many use it to hold hot soup. 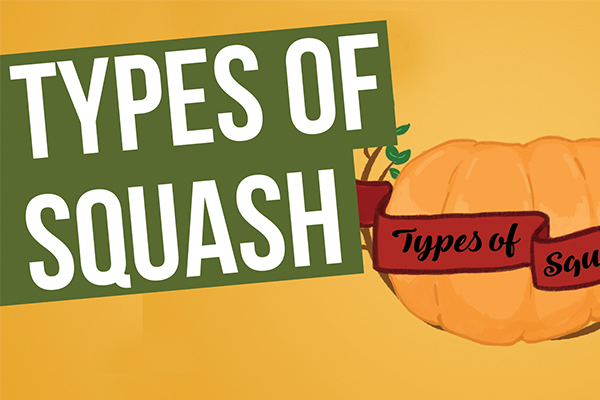 Be the first to comment on "The Different Types of Squash You Should Know About"